In order to help me plan better, I decided I should document what I actually do with my plans, so I can use that information for future planning. 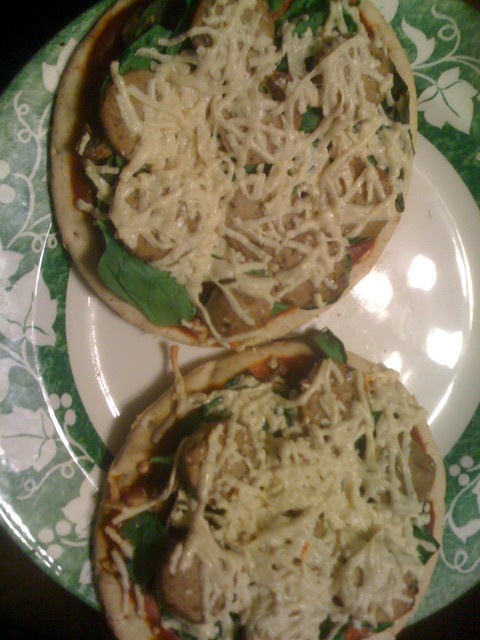 So, I took pictures of our dinners each night this week, and I am gong to compare the plan with what happened, along with notes about what changes I made to the recipes. The pictures are not that great, but I have hungry children waiting to eat when I put this stuff on the table! Exactly what was on the menu. It was so delicious, too! 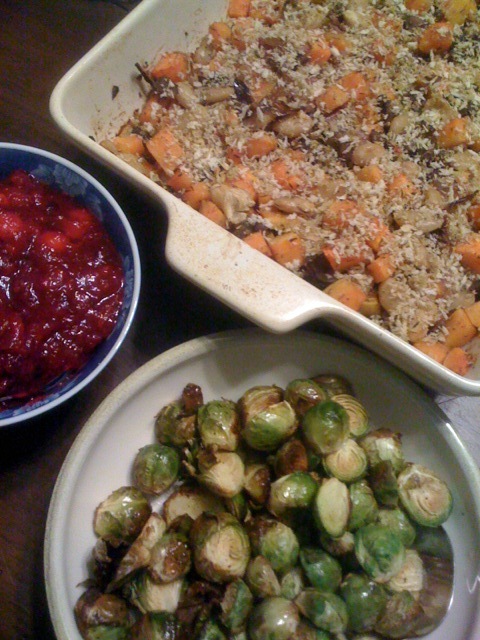 Okay, I was the only one who liked the Brussels sprouts, but I only made the kids eat two bites, and they survived, and I liked them enough for everyone. Both kids like butternut squash, so that was helpful. This was the first time I had had chestnuts. They were good, but kind of expensive. We will be having this again. Pretty much what was planned, except that Trader Joe’s didn’t have any blackberries, so we had blueberries instead. I know, totally out of season, but I am making many efforts to eat seasonally, and sometimes I just crave the out of season stuff. As for the mole skillet pie, did you go to the link? It has chocolate in it! It was awesome. I used turnip greens from the garden, and I added a grated zucchini to the filling because I had a zucchini in the fridge and I wanted to use it before it went bad. My mom was over for dinner this night, and she said I should definitely make it again, which I was already planning to do. I volunteered at the elementary book school fair from 4 – 6, then we had to walk through the book fair and pick out some books, and then we walked home, and we had a pretty short amount of time to get dinner cooked, served and eaten before the kids were picked up by their dad. Fortunately I had some gnocchi and a jar of sauce in the cabinet, which I can get on the table in 20 minutes from taking out the pot. 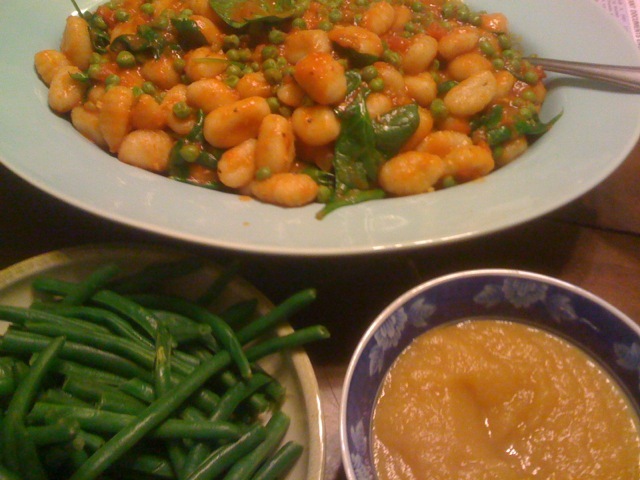 I added some frozen peas and a bit of baby spinach, and rounded out the meal with some steamed green beans and applesauce. We all liked this, and it saved us on a busy night. 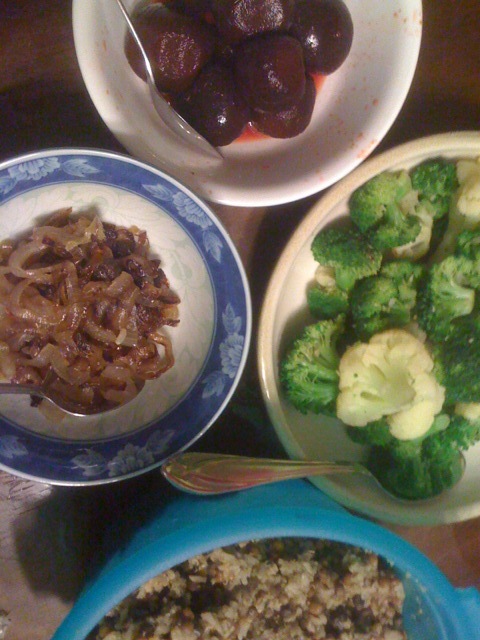 I got this started, with onions carmelizing on the stove, and brown rice and quinoa in the microwave steamer, when I found that I was out of tahini! How could this happen? I definitely need to head to the international foods store for the big tub of tahini this weekend–that is the best part of the meal! It was still pretty good, though, although the beets were a bit old, and neither the boy nor I liked them (the girl doesn’t like them anyway. )﻿ I spent all of the time that I would have used making the sweet potatoes looking for tahini, so we did without and I grabbed a bag of broccoli and cauliflower florets I could throw in the microwave for 5 minutes instead. We ate the green beans on Tuesday, so those weren’t available tonight. 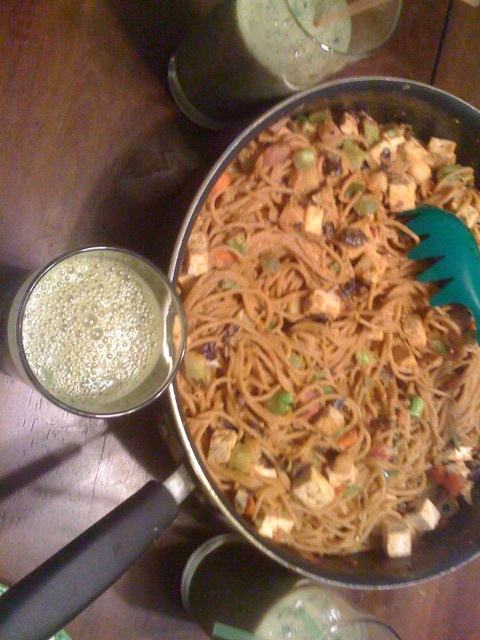 The peanut noodles had plenty of veggies, though, so I decided to just forget that element of the meal. I made a double batch of the sauce, and used a tub of Healthy 8 diced veggies from Trader Joe’s, along with a pound of extra firm tofu. Personally, I think that if this was the only recipe I ever got off the internet, it would be worth it, because it is just so darn awesome, but the kids aren’t really fans. Of course, the boy said he didn’t like it, but ﻿still had seconds; the girl didn’t eat much. We all liked the smoothies, though. I used 2 cups of calcium-enriched orange juice, 1 cup of vanilla soy yogurt, 1 cup of blueberries and a bunch of baby spinach. The girl does not like that they are green, but she does like the taste. All in all, a pretty good use of the plan. 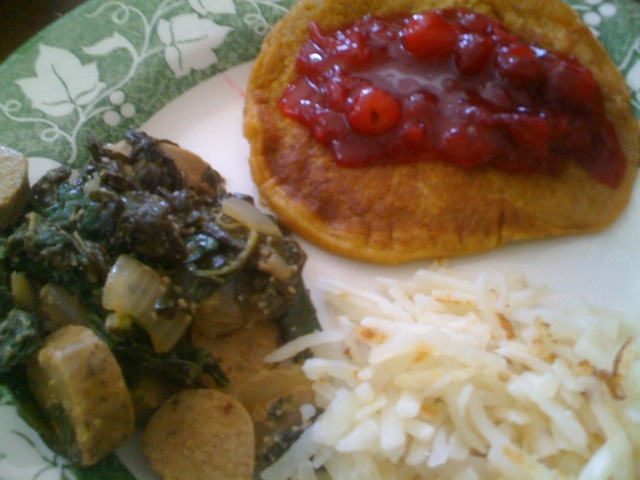 We mostly had what I planned on, with some slight changes in the side dishes and one wholesale substitution. I think we did get a fair amount of fruits and veggies with dinner, and I ate a lot of leftovers for lunches, so I got plenty of veggies during the day. The kids did bring some baby carrots, so they did get a bit more veggies, although we are still working on that. http://rcm.amazon.com/e/cm?t=thealmvegpro-20&o=1&p=8&l=bpl&asins=1401340881&fc1=000000&IS2=1&lt1=_blank&m=amazon&lc1=0000FF&bc1=000000&bg1=FFFFFF&f=ifr I have mixed feelings about this book. On the one hand, I am currently investigating the possibility that my son might have ADHD, and I am newly diagnosed with the condition myself, so I have a lot of identification with this situation. Many things that Ellison describes in this book seemed right on target. I recognized many situations, which was validating. Also, she has some very good suggestions and does a fairly thorough review of the treatment philosphies and options out there for this condition. On the other hand, she seems a bit overly antagonistic toward her son at times. I understand that there are two things going on here, probably: her need to make people understand that this really is outside the normal high-spiritedness of kids, and does deserve a diagnosis and support (because there is a lot of bias toward this diagnosis, and a widespread belief that the condition doesn’t really exist), and the fact that she is focusing on the difficult behaviors because that is what the book is about. However, it seems she could have done that in the context of a more well-rounded view of her son and their relationship. For the first third of the book or so, this kid sounds terrible. She talks so much about how he hurts his brother, I started to wonder why she didn’t consider institutionalizing him. Once she established the severity of the problem, she did seem to back off that a bit and he sounded like a not bad kid who happens to have some difficulties, but geez, it was a bit much. Also, it seemed farily clear that the biggest thing that she did during this year of working on her son’s problem was to stop seeing him as the enemy and start working with him rather than against him, which I found a bit frustrating. Parenting 101: you never win a power struggle with your kids. Never. This has nothing to do with ADHD. That said, I read the book in less than 2 days after it came in the mail, and I feel that I learned a lot from it. I particularly liked seeing this Pulitzer prize winning journalist struggle with the same day to day tasks that trouble me. It makes me feel better about my potential and the accuracy of my own diagnosis. I appreciated Ellison’s bravery and honesty in detailing both her son’s and her own behaviors that were, at times, (far) less than perfect. All parents have an ideal that they strive toward as a parent, and they all fall short at times. Showing her own failures opens her up to negative feedback that must be difficult to hear. Despite my criticisms above, I could clearly tell from this book that Ellison loves her sons and is a good parent to them. Overall, definitely recommended, despite my annoyances with a few points. 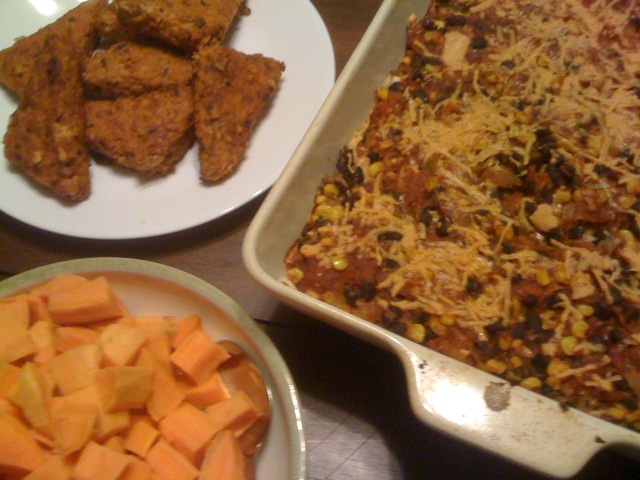 I am continuing my quest to make more of the delicious recipes from Veganomicon this week with two casseroles.The girl will probably not be happy (she doesn’t like her food to be touching! ), but I am really excited about these recipes. The menu only goes through Thursday this week because the kids are going to their dad’s on the weekend, and I get paid on Friday. I will probably eat something out on Friday, then do a new plan on Saturday. I am going to use up some of the turnip greens that are still going strong in my garden despite the frosty nights, and the butternut squash I still have from the garden, so I am still using some garden produce! You can also see how much I love carmelized onions in this menu. I tried to add plenty of plained steamed veggies and furits to the menu so that the girl doesn’t starve, but I know she will also be happy on Tuesday and Wednesday–even though the main dishes on those nights aren’t plain foods, she still likes them. I am going to wear her down eventually on the casserole thing, I am sure of it! It turned out to be more universally orange than I was anticipating. It still had plenty of nutrients, but the plate would have been more interesting if we could have seen more colors. 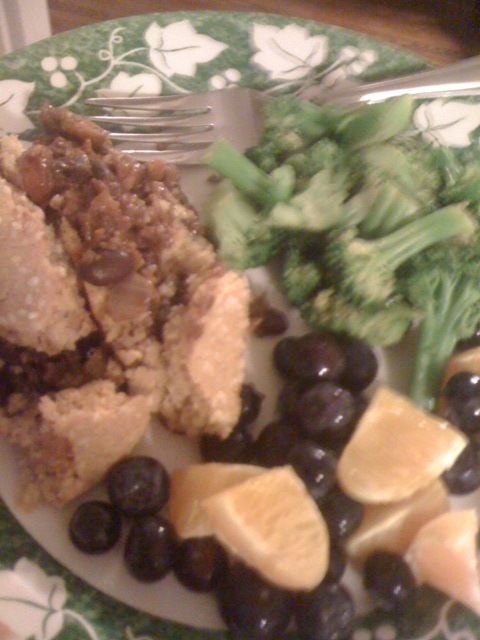 The hot sauce glazed tempeh was amazing, and even better the next day. This is a huge casserole. We had a friend over, and only ate half of the casserole. The nine corn tortillas that I had on hand were enough, although the 12 called for would have provided better coverage. I was maybe just a little bit crazy trying to make the pieces I had cover the whole layer. Obviously, the lack of garlic in the original recipe was an oversight. Who would purposely leave garlic out of such a recipe? Crazy peole, that’s who. I added about 3 or 4 cloves of crushed garlic after the onions had cooked for a few minutes. I also added just a bit more cumin. Overall, it was delicious. I will just have a non-orange vegetable instead of the sweet potato next time. http://rcm.amazon.com/e/cm?t=thealmvegpro-20&o=1&p=8&l=bpl&asins=156924264X&fc1=000000&IS2=1&lt1=_blank&m=amazon&lc1=0000FF&bc1=000000&bg1=FFFFFF&f=ifr I know, this week is more than half over when you consider that I only made a Monday through Friday plan, but I want to document it anyway. I like to look back at old menu plans when I am making new ones, and my usual method of writing the menu on random pieces of paper is not very helpful for this. Plus, I can add notes on what I actually did this way, which is also useful. I was going to make grilled cheese sandwiches with some shredded Daiya cheddar cheese, but I didn’t make it to Whole Foods to get the cheese, so we did without. 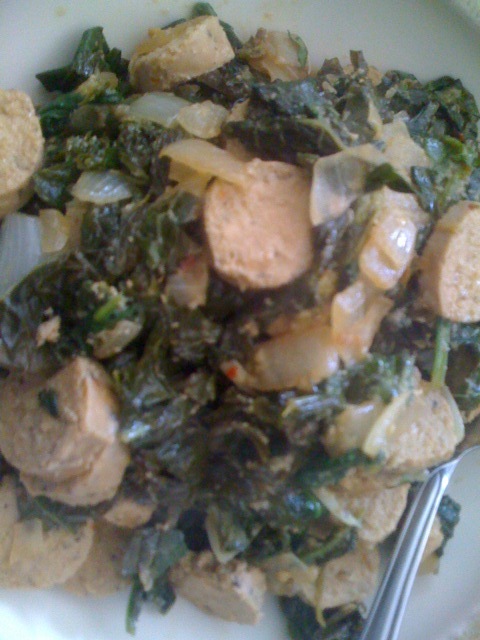 Also, I added some spinach from the fridge and chopped turnip greens from the garden to the soup. 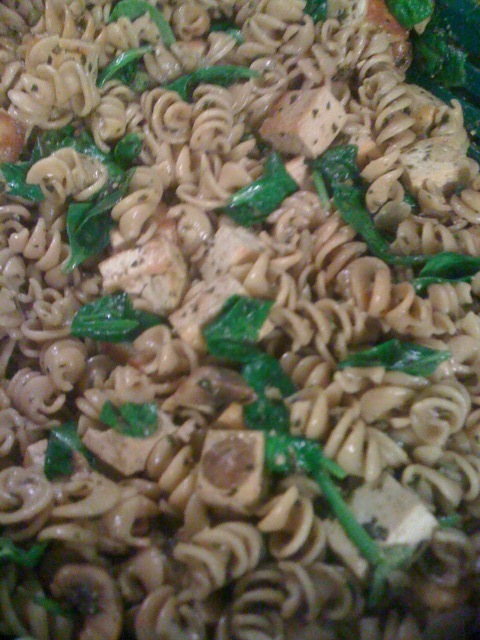 The kids were unimpressed with the addition of the greens, and with the mushrooms called for in the recipe, but I am hoping to wear them down eventually. I substituted broccoli for the asparagus called for in the recipe (because the kids actually eat broccoli), and added a lot more—two 14 ounce bags of florets. I also doubled the sauce to make sure there was enough. 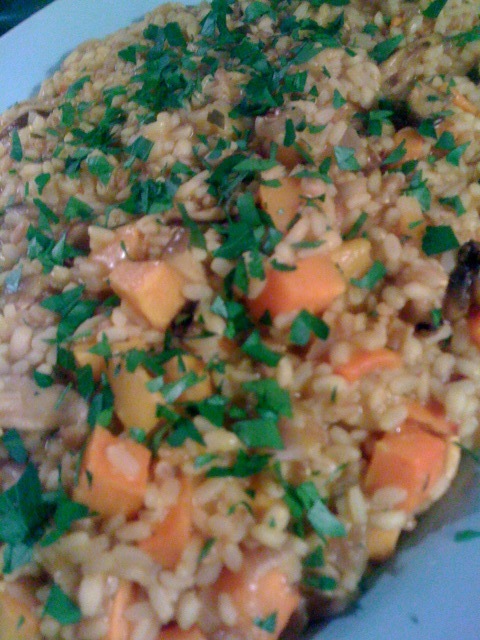 The butternut squash wasn’t on the menu to begin with, but I had gotten a bag of cubed squash from Trader Joe’s to make risotto last week and only used half, and I decided to use it up while it was still good. I just sprinkled it with some cinnamon and nutmeg, sprayed it with some cooking spray and mixed it up a bit, then tossed it in the oven where I was roasting the tofu and broccoli already. The kids liked this, which is fantastic! I know, that is two nights of vaguely Chinese tofu and rice dishes in a row. Originally this was supposed to be Thursday’s dinner, but my friend Andrea is coming over tonight, and she will appreciate the original Wednesday menu more than the kids will, so I did a switcheroo. I am hoping that if I steam a bunch of sweet potatoes, the kids will take some in their lunches. They actually like sweet potatoes. I am really trying to get more veggies in their lunches, because they cannot eat enough at dinner to cover a full day’s supply, and that is where they eat most of their veggies now. 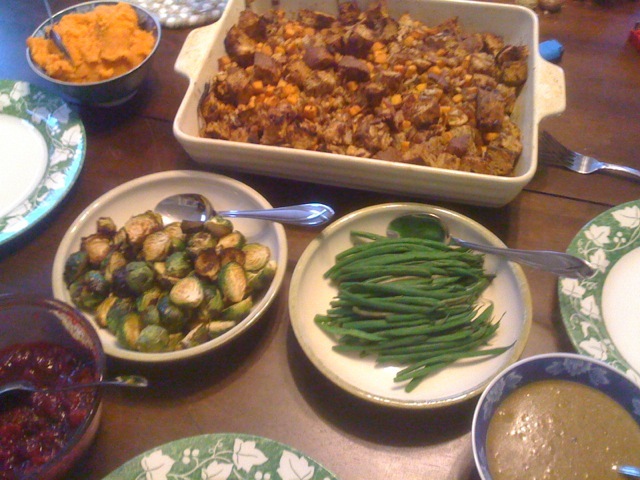 Oh, and I personally am really excited about the hot-sauce glazed tempeh! 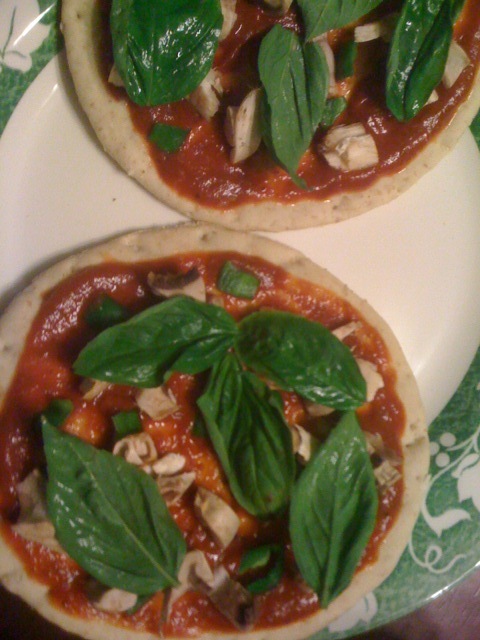 I am thinking of making a double batch so that I have leftovers for a long time. I don’t think the girl is going to be excited about the green smoothies, but the boy will! And everything goes better with pizza, at least around here. I haven’t really thought through the weekend, but I have plenty of stuff around the house. I am going to so some more planning this weekend. I would like to avoid going to the grocery store until payday on the 19th. I could buy groceries (although not many! ), but I want to try to use up what I have and see how creative I can be. I suspect there will be at least a short trip to the store for fresh fruit and veggies, but I am going to see what I can do with what I have first.